Vineyard close to the ancient site of Nemea. 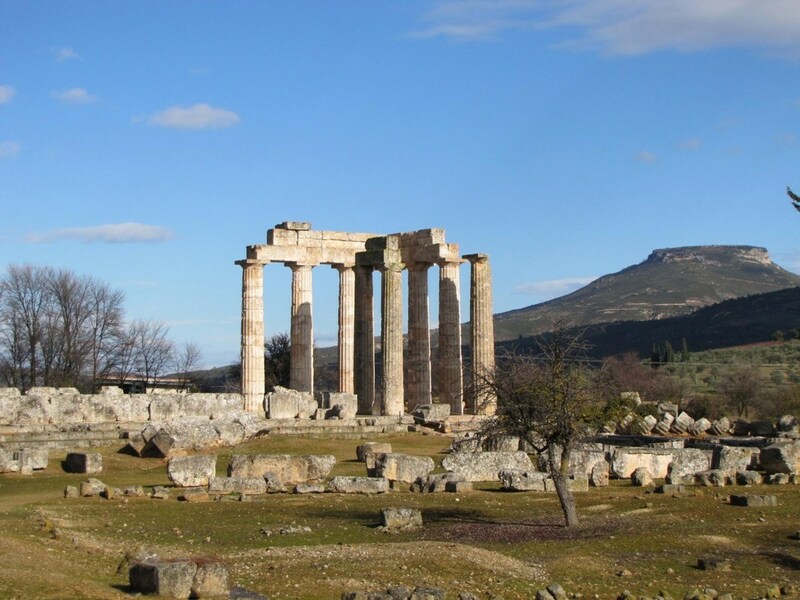 ​​​Nemea is an ancient site in the northeastern part of the Peloponnese, in Greece. Formerly part of the territory of Cleonae in Argolis, it is situated in the regional unit of Corinthia. 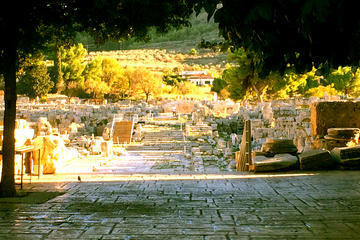 The small village of Archaia Nemea (Ancient Nemea) is immediately southwest of the archaeological site, while the new town of Nemea lies to the west. Here, in Greek mythology, the hero Heracles overcame the Nemean Lion of the goddess Hera. In the ancient Greek times the Nemean Games would take place here, dated from at least 573 BC, and celebrated in the eleven Nemean odes of Pindar. 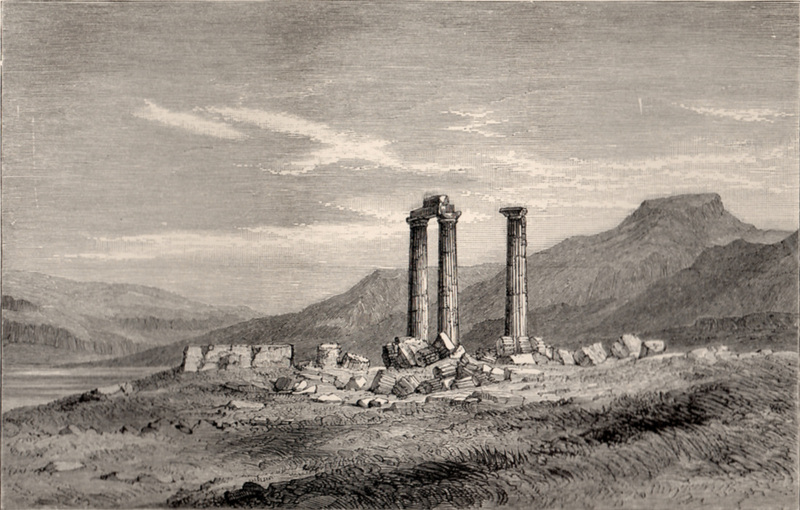 Old engraving of the temple at Nemea. At the temenos, the grave of Opheltes was surrounded by open-air altars and enclosed within a stone wall. The sanctuary's necessary spring was named Adrasteia. The historian Pausanias wondered whether it had the name because an "Adrastos" had "discovered" it, but Adrasteia, the "inescapable one", was a nurse of the infant Zeus in Crete. The tumulus, the ancient burial mound nearby, was credited as the burial mound of his father, and the men of Argos had the privilege of naming the priest of Nemean Zeus, as Pausanias was informed when he visited in the late 2nd century CE. In Pausanias time the temple, which he noted was "worth seeing", stood in a grove of cypresses; its roof had fallen in and there was no cult image within the temple. Three limestone columns of the Temple of Nemean Zeus of about 330 BC have stood since their construction, and six more were reconstructed in 2002 and 2007. Three orders of architecture were employed at this temple, which stands at the end of the Classic period and presages this and other developments of Hellenistic architecture, such as the slenderness (a height of 6.34 column diameters) of the Doric columns of the exterior. The site around the temple has been excavated since 1973 and the great open-air altar, baths, and ancient accommodations for visitors have been unearthed. The temple stands on the site of a prior Archaic-period temple, of which only a foundation wall is still visible. The stadion has recently been discovered. It is notable for its well-preserved vaulted entrance tunnel, dated to about 320 BC, with ancient graffiti on the walls. The material discovered in the excavations is on display in an on-site museum constructed as a part of the University of California's excavations. The restored Temple of Zeus at Nemea. ​In 394 BC the Battle of the Nemea River was fought between Sparta and her allies the Achaians, Eleians, Mantineians, and the Tegeates against a coalition of Boetians, Euboeans, Athenians, Corinthians, and Argives. This was to be the last clear-cut victory that Sparta enjoyed. The tactics were similar to all other Greek hoplite battles, except that when the armies were arrayed, with the Spartans having the customary honor of being on the right, the army drifted right as it advanced. This was not good for the Spartan allies, as it exposed the soldiers to a flanking attack, but it gave the Spartans the opportunity to use their superior coordination and discipline to roll up the flank of the Athenians, who were stationed opposite. The result of the battle was a victory for Sparta, even though her allies on the left suffered significant losses. This willingness to accept losses on the left flank for flanking position on the right was a dramatic change from typical conservative military tactics. 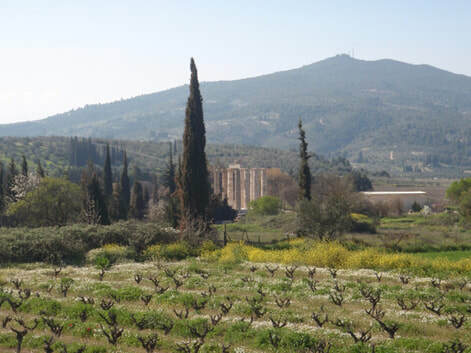 combining a visit and tour of an award-winning Nemea winery and vineyards in the Peloponnese countryside with the site of Ancient Corinth. allowing flexibility, with an expert English-speaking driver/guide.